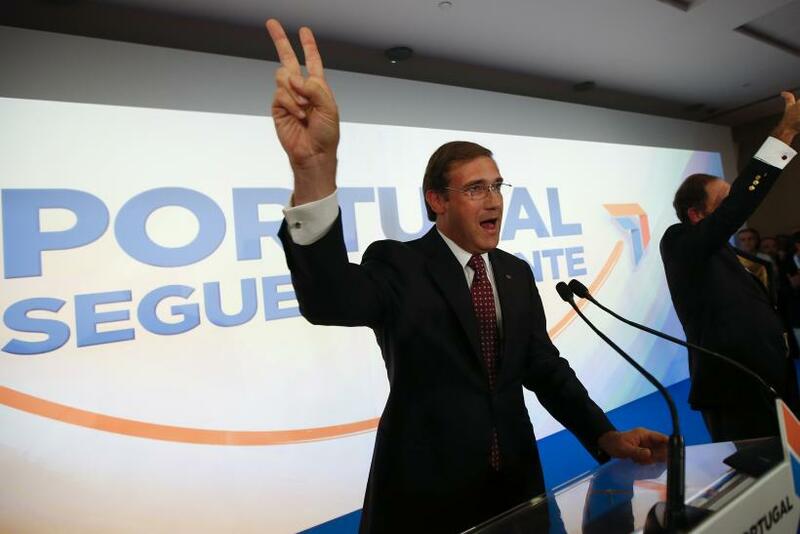 Portugal's center-right coalition government won another four-year term Sunday, the Associated Press reported. The government won the general election behind the message that the country's economy had begun improving despite often panned austerity measures. The AP reported that with 98 percent of districts reporting, the government had earned 39 percent of the vote, compared with 32 percent for the opposition center-left Socialist Party. The BBC reported the same figures. Socialist leader Antonio Costa admitted defeat Sunday and congratulated incumbent Prime Minister Pedro Passos Coelho, according to the BBC. While the center-right coalition won, it was not a complete victory. Projections indicated the government would likely to fall short of earning an outright majority in Parliament, which required 44 percent of the vote. The government would then likely be outnumbered in the 230-seat chamber by lawmakers who skew left of center and could block proposed policies. Amid the eurozone's debt crisis, Portugal received a 78-billion-euro bailout in 2011. The government complied with a German-led austerity plan that cut pay, pensions and public services while increasing taxes, which helped send the economy into a three-year recession, the AP reported. The Socialist Party had hoped it could benefit from the backlash to the austerity measures and win the election. While the center-right coalition won, it did not come close to achieving the results of the last election in 2011, when it won 50.3 percent of the vote, Reuters reported. Portugal's economy is improving, which perhaps provided a boost to Passos Coelho, who was able to suggest the austerity had begun to pay off. The coalition has vowed to continue the policies. The economy grew by 1.5 percent in the first half of 2015, compared with last year, and record levels of unemployment fell. Socialist leader Costa warned that while the government had earned re-election, it would have to change its ways without an absolute majority. "The government has to understand that things are different now," he said, according to the AP. He added that he also did not aim to make the country impossible to govern. Portugal did not vote in support of new, more radical choices -- like Greece's Syriza party and Spain's Podemos party -- that have challenged the mainstream parties in Europe amid the debt crisis.